Many organizations struggle to decide on the best way to train their employees. In order to ensure employees are properly equipped to execute all their position requires, we (the leaders in charge of training programs) must take a step back and think about how we’re fundamentally conditioned to learn in the first place. Step inside any K-12 classroom and you might see a version of Jeopardy, Bingo or Memory in play. Many early childhood educators are intent on entertaining their students and amping up their creativity in order to get their lessons to stick. But what about Adult Learners? We Like to Be Entertained too, Right? Yes, right! Yet for some reason, once you wear that all-important cap-and-gown on your high school graduation day, the fun and intentionality in learning seems to end – or at least be pretty rare. Especially post-college, most of our instruction consists of dry PowerPoint presentations or scores of text that are painful to get through. Clicking through a slide deck just isn't good enough for today's learner, regardless of age, job setting, or learning outcome. Learning needs to follow a framework that enables the student to relate what their learner is teaching, have fun doing so, thoroughly understand and see how it works, practice it and then apply it to the real world. The bottom line? We need to make learning fun again – and effectual for those of us who are eager to learn and improve our skills. Just like when we were back in grade school, any concept is much more accessible to an audience if they can relate it to something with which they’re familiar. For example, one of my colleagues just did a training on Marketo Programs. She asked attendees if they remembered having a binder in school. Why? Because it held all the important things you needed to focus, like folders for class, notepaper, homework assignments and the occasional scribbles and notes to the boy you’ve been crushing over. She went on to explain that Marketo Programs are just like that binder you had in school: they hold all your essentials you need within a Marketo campaign. Once that concept resonates with a learner, they can hold onto the idea and understand it so much more. After you’ve related your concept to something familiar to your learner, it’s time to reiterate the overarching message of your topic by introducing the next layer of your material. If we keep with the Marketo Program example, we could say, “I'm going to talk to you about Marketo Programs. They're really the most important aspects to starting a campaign within Marketo. You need to have these so your campaigns will be organized and in line; otherwise your Marketo instance will look a little bit like the Wild Wild West. Now that you know what these are all about, I'm going to show you what they look like and how you can create them yourselves." This is obviously a simple example, but it helps to illustrate the importance of telling your learner what you’re planning on teaching them, so they are mentally prepared for the task at hand. Relating and telling is fine and good (and important! ), but it doesn’t stick unless you then show what you mean. When you show something, it doesn’t have to be something visual necessarily. For example, you could go into detail about a theory if that’s what you’re covering. However, if you do have something to tangibly demonstrate, like a simulation, then you can do that at this point. Let’s put this back in terms of child learners again. My daughter likes My Little Ponies, so I can use them to visually show her how to add and subtract. She’s already comfortable with this toy, and being able to see what I’m telling her can go a long way in helping these math concepts sink in. Think of what might be comfortable and easy to grasp for the adults you’re teaching, and you’ll have a better time showing them what you mean. In the Marketo Programs example, or really any software simulation example, this is the phase in which you’ll show a demo or walk your learner through the process of completing a task within the software you’re teaching. This is also where you’ll show helpful hints and pro tips so the learner won't skip a beat when they practice this task on their own. Now, this is the really fun part that many instructors miss when they’re teaching adults. Don’t assume your learners will be able to absorb what you’ve said and shown without having a chance to practice. 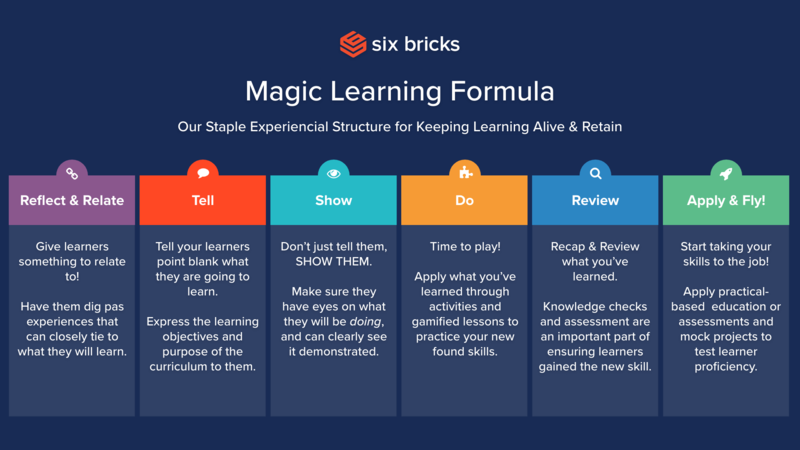 At Six Bricks, we want to give learners the opportunity to practice while they’re learning – rather than practicing their new skills only on the job. So, we put you in the hot seat, so to speak. You can do this with your learners by setting up a hands-on activity for them based on what you’ve taught, and guiding them through it. If we go back to the Marketo Programs example, we could give our learners a scenario as a Marketo practitioner and ask them to create a Program themselves, now that they've learned on-paper how, why and where to create one. "Doing" gives them the opportunity to actually well—do, and reinforces the learned knowledge through action. “Learning by doing” is a mantra sang often in adult learning, but it isn’t always carried out effectively. Giving learners the opportunity to practice the “doing” of a task within a simulation or activity is a great way for learners to stay engaged and helps them retain their learning far better than if they were simply sitting through a lecture on a topic. At Six Bricks, we believe in this phase so much, that we dedicate around a third of most of our courses to lessons that allow learners to attain knowledge through gamified learning by doing. It’s also plain fun this way, there’s no buts about it! Once your learners have tried their hand at doing what they’ve learned, it’s time for you to review the subject matter once again. This is basically a knowledge check. You can gamify this and make it interactive to really engage your students or simply serve up a quick five-question quiz to assess their understanding of the subject matter so far. But remember, there is no point in doing or practicing if you don’t get to assess how you did. Finally, you can release your learners to do some level of real application of what you’ve taught. Oftentimes, learners (especially adult ones) are taught a topic and then immediately asked to apply their knowledge on the job. This doesn’t really fly when you miss half the steps in learning something new. While most “application” will be applied on the job, we take the learning a step further by empowering learners to take a Practical Lab at Six Bricks. This is the sum of all the great teaching they've gone through. It allows them to apply or simulate that learning through a real life, on-the-job scenario seen in modern day sales, customer service or marketing environments. For us, the application might mean running a mock campaign or completing a series of job tasks within a software simulation; either way, it seeks to get your learner to apply what they’ve learned before the actual job starts. Now that you understand the six prongs of effective learning, you can go about incorporating them into your next course or training session. To get you started on the right path, download this worksheet. It’ll lead you through how to Relate, Tell, Show, Do, Review and Apply, so you can take your next course to the next level with your adult learners.